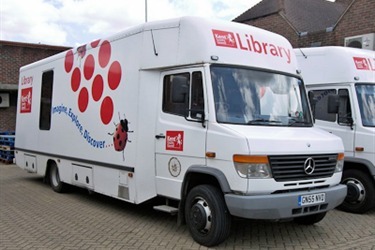 The fleet of 11 mobile libraries visits nearly every village and hamlet in the county, making over 600 stops on a weekly or fortnightly basis. The time at each stop can vary between 10 minutes and 3 hours; the length of the stop depending on the size of the community and number of customers that use the services of our Mobiles. All have lift access. Most mobile libraries carry a stock of over 1800 books and audio items and the selection is constantly renewed. Community information is also available on board and the staff are happy to provide access to the wider network of Kent libraries through reservations for particular items and requests for information.